All these 3 files are stored in "%windir%\System32" folder. 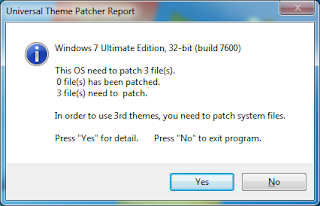 Manually patching these files is a risky and time consuming task, so we are sharing a small utility which can help you in patching these files easily and quickly. 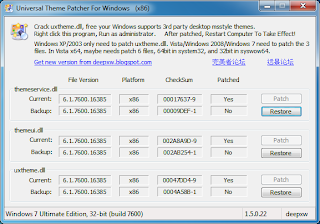 "Universal Theme Patcher" is an excellent UxTheme Patcher which supports Windows XP SP2/SP3, Server 2003, Vista SP1/SP2, Server 2008 and Windows 7. It can be used in both 32-bit (x86) and 64-bit (x64) systems. 5. 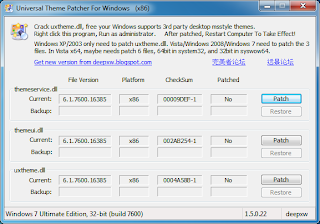 Restart your system and you'll be able to use 3rd party themes in Windows 7 without any problem. 6. At last simply copy the .theme file and its theme folder to "%windir%\Resources\Themes" folder (where %windir% means "Windows" directory present in system drive where Windows 7 is installed. Most probably C: drive). 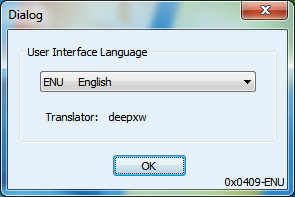 Now double-click on .theme file and it'll apply the theme or you can apply it using Desktop Personalization window. dude the setup file is unable to install ..i jus changed the extension to .exe n wen i run that file it was unable to start the installation..wat can i do? Click the link in my site> Click @ Download> enter capcha & download start>>>> a 10 second process. I dont understand what do you mean by 20 minute. Please stop browsing other site same time mate!!!! I download theme files but there is not any .exe file for install.